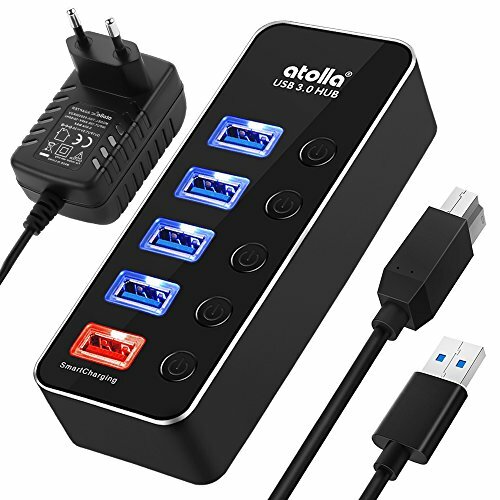 4-port USB hub expands 1 USB 3.0 port to 4 external USB 3.0 data ports for more USB devices, sync data at blazing speeds up to 5Gbps in no time. The host USB port on the computer supplies a combined current of 0.9A, adding a power adapter can add it up to 1.5A to make transferring more stable. On and off switches with led indicators for each port are designed to turn on or off the individual USB port without unplugging the equipment, and blue LED lights show the working status easily. A smart charging port delivers the fastest possible charge for various devices, including Apple and Android phones and tablets as well as cameras, consoles and more. The atolla D2 USB 3.0 hub is securely protected by its solid body, made of industrial aluminum alloy, easier to carry with a detachable cord. No driver required; support Plug & Play and Hot Swap. We provide an 18-month warranty and friendly, easy-to-reach support. Because we believe a good product is inseparable from our customer's support and feedback. For a stable connection, the devices connected to this USB 3.0 Hub with power adapter must not exceed a combined current of 5 volts 3.5 Ah. External hard-drives should be connected with its own power source. 1.More data ports and quick synchronization: Turn 1 USB data port to 4, syncing data transfer speeds up to 5Gbps. 2.Individual on-off switches: No need to unplug devices after using, turn it off directly. 3.Smart charging port including AC adapter（US standard）: This port can provide up to 2.4A power supply for charging your mobile phone and tablet and more. In addition, An AC adapter can help transfer large amount of data more stably. 4.Aluminum unibody: Provides premium protection.